Preview Short URLs Before Clicking – Works with TinyUrl and the Rest! I just got an email and the person sending it was promoting (spamming) a product but I was curious about what it was. The solution is provided by http://longurl.org/. There are some browser based URL lengtheners and TinyURL have a cookie thing that allegedly makes URLs long again, these require the URL to be on a webpage (mostly used for Twitter really). No good if you get one on an email. Long URL not only tells you where the short URL goes to, it displays each step along the way and provides a small image preview of the site. The only criticism is that the preview is a bit too small to really work out what the site is about. 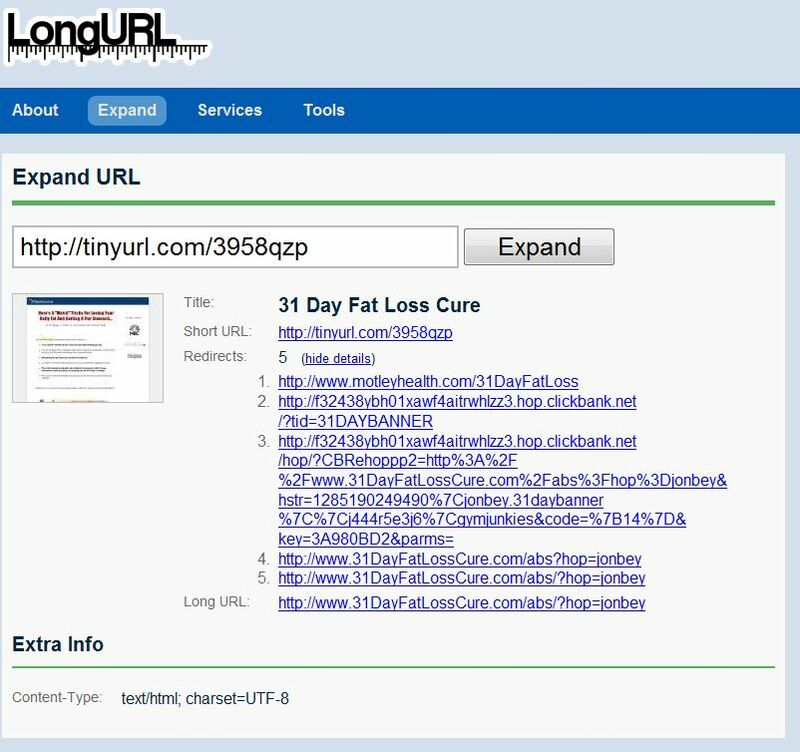 The URL I was emailed redirected first to a shopping cart, then to a tracking domain, and finally to an affiliate page for weight loss eBooks. I can only assume that the person sending the email either thought I would buy the product or give them some exposure on my own website. Anyway, there you go. An excellent service. Ideally Avast! or one of the other Anti-Virus outfits should provide something like this to check a URL before you visit. Now there is an idea! It’s a good shortening service, try it! That is not an alternative, it’s a URL shortening service. Does it preview short URLs?